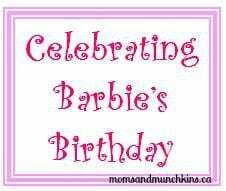 Planning on celebrating Barbie’s birthday? Barbie’s birthday is on March 9th and in 2012 she’ll be turning 53. Don’t you wish we could all age so gracefully? This would be a fun day to plan a pink tea party for your little ones complete with pink lemonade, pink cupcakes and a cute little tea set. Have each of the little ones bring along their favorite Barbie as well to be included in the activities & celebrations of the day. If you want to make Barbie feel even more special, visit your local party store where you’ll find Barbie decor such as plates & banners. Don’t forget pink balloons! Even without Barbie themed decor, you can set the theme for a party party with plenty of pink & glittery decorations. You could use items like balloons, streamers and tableware. You could set up a mini party area for the Barbie’s as well. Things like a little pool party area, soda shop, nail salon, tables and chairs for a special supper and even a staged area for entertainment. That’s quite the mini party, isn’t it? Did you play with Barbies as a child? I had plenty of them along with a Barbie soda shop & corvette – it was so much fun! Stay updated on the latest ideas for family fun by following us on Facebook, Twitter, Pinterest and Bloglovin’. I’m doing a Barbie themed birthday party for my (turning) 6 year old in February. I need to get planning!